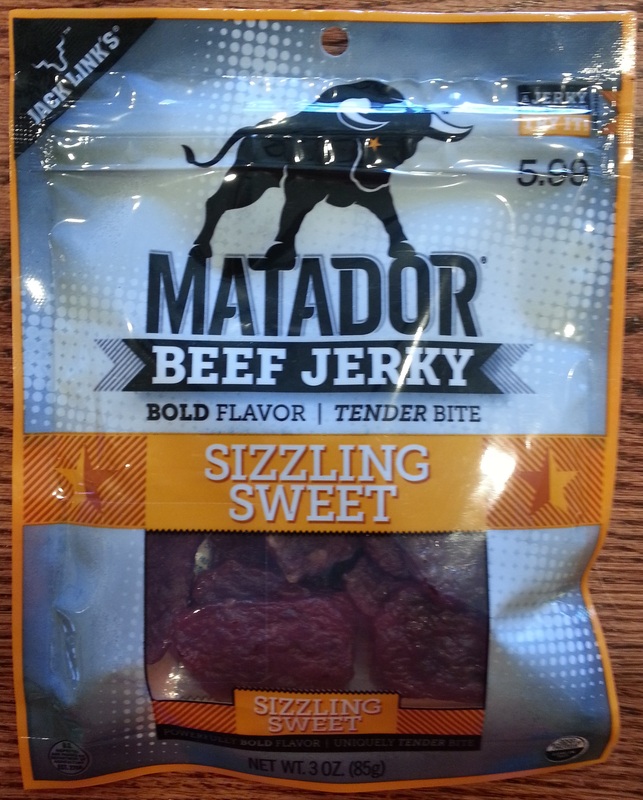 We’re taking a gander at some Jack Link’s Sizzling Sweet Matador Beef Jerky purchased at a convenience store in the South part of Dallas, Texas. 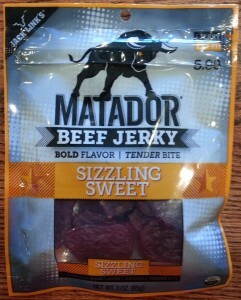 Taste (C+): You have to concede the ’Bold flavor’ boast for this jerky. At first bite you’re assailed with a Tobasco-like sizzle intermingled with a simple sugary sweetness. The first bite kicks hard, too, and lingers for a bit. No fear though, it mellows quickly and becomes pretty enjoyable. It’s a taste that will really appeal to the spice-happy among us, but less so for most folks. Texture (A): This jerky is tender with a capital T. It’s moist and firm and feels great in your mouth. It’s clearly an expertly made snack and you’ll appreciate the obvious quality. Smell (B+): This jerky actually smells better than it tastes! You get the scent of the ‘sizzle’, with hints of peppers and the like, but it blends nicely with the sweet and savory smells of this treat to combine into something pretty enjoyable. Appearance (A-): They made a good-looking jerky here. It has a rich reddish-brown color and sports a slight sheen. It’s well-formed, has a nice shape, and is generally enjoyable. It speaks to the quality of this treat in a loud, clear voice. Nicely done! Consistency (A+): Every bit of this jerky is alike the others with a zealous attention to execution. It’s a fantastic example of what you can do with the pressed/formed people treat jerky. The Jack Link folks know their stuff. Good job! Overall Impression (B): Go ahead and try it. If you’re a fan of the pepper-kick-in-the-mouth sort of jerky this one will probably count among your quick favorites. If the ‘sizzle’ isn’t really your thing, you’ll probably enjoy giving it a try anyway. It tastes good and, after a bit, the sizzle simmers down and you’re left with a tasty treat that’s enjoyable to eat. See a bag, grab a bag. Enjoy, my hungry friends!